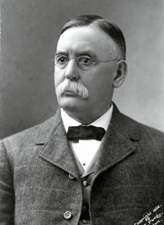 PATTERSON, Thomas MacDonald, a Delegate, a Representative and a Senator from Colorado; born in County Carlow, Ireland, November 4, 1839; immigrated to the United States with his parents, who settled in New York City in 1849; attended the public schools; moved with his parents to Crawfordsville, Ind., in 1853; worked in a printing office for three years and as a watchmaker and jeweler for five years; during the Civil War enlisted in the Eleventh Regiment, Indiana Volunteer Infantry, in 1861; attended the Indiana Asbury (now De Pauw) University, Greencastle, Ind., 1862 and Wabash College, Crawfordsville, Ind., 1863; studied law; admitted to the bar in 1867 and commenced practice in Crawfordsville, Ind. ; moved to Denver, Colo., in 1872 and continued the practice of law; city attorney of Denver 1873-1874; elected as a Democrat to be a Delegate to the Forty-fourth Congress and served from March 4, 1875, to August 1, 1876, when the Territory became a State; successfully contested the election of James B. Belford to the Forty-fifth Congress and served from December 13, 1877, to March 3, 1879; was not a candidate for renomination in 1878; resumed the practice of law in Denver; member of the Democratic National Committee 1874-1880; purchased the Rocky Mountain News in 1890 and later the Denver Times; elected as a Democrat to the United States Senate and served from March 4, 1901, to March 3, 1907; was not a candidate for reelection; twice an unsuccessful Democratic candidate for governor; resumed newspaper activities in Denver, Colo., and died there July 23, 1916; interment in Fairmount Cemetery. Dictionary of American Biography; Downing, Sybil, and Robert E. Smith. Tom Patterson: Colorado Crusader for Change. Niwot: University of Colorado, 1995; Smith, Robert E. The Anti-Imperialist Crusade of Thomas M. Patterson." Colorado Magazine 51 (Winter 1974): 28-42.